The number 13 may be unlucky for some but not for me. Join me as I showcase my favourite thirteen surf images of my two year journey throughout the Latin Americas. Follow this once in a lifetime journey. Live your life, love the life you live.....these are words of which I now try to live my life by. Over two years ago I sold all of my earthly belongings, packed my bags and departed Australia to follow my dream of traveling and shooting surf photography throughout the Central and South Americas. I wanted to experience and feel the once familiar but long lost sense of adventure pumping through my veins once again. I was desperate to step out of my comfortable life and step into a new life of fresh and unfamiliar challenges and experiences. Over a two year period I traveled from Mexico in Central America all the way to the Southern depths of Chile. I passed through 14 different countries in total and encountered numerous new cultures, people, languages while discovering a multitude of new surf destinations. This was the journey and experience of a life time. The following is a collection of my favourite moments captured during my adventures through the Latin Americas which I hope will inspire you to get out on the road and follow your dreams whatever they may be. This artcile was alos featured on Russel Ord's website Vagabond Photographic. Photo 1: The Final Frontier. The Pacific Coast of Colombia. Is Colombia’s pacific coast the final frontier for surfing in the Latin Americas? Despite this secluded region of Colombia arguably housing some of the best waves in the region, it’s not exactly a hotspot for traveling surfers and not without reason. This stretch of coast has long flown under the surfing radar, likely from a combination of isolation and the long shadow of a violent past. As recent as ten years ago this beautiful coastline of Colombia was a no-go zone infested with left-wing guerrilla groups, paramilitaries, and drug traffickers battling for control of the main drug trafficking route in Colombia. 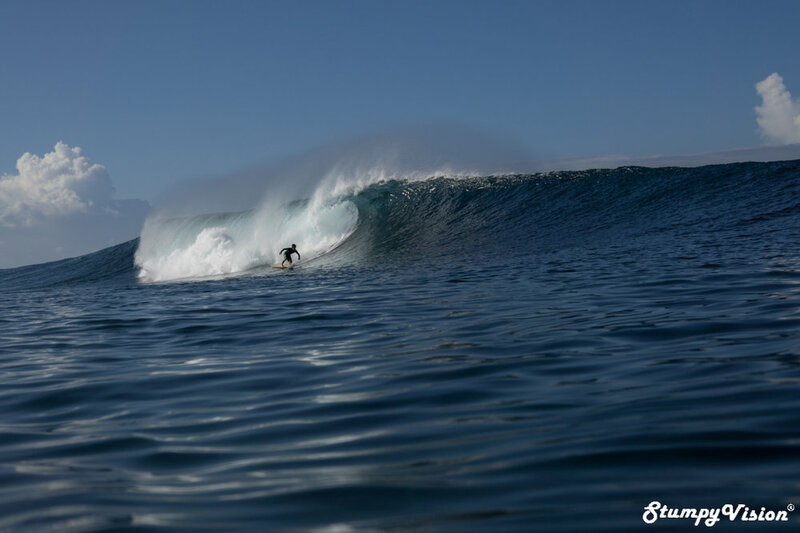 However, in recent years this situation has rapidly changed and we are finally seeing peace and stability arrive in this beautiful region thus opening the door for adventurous surfers to discover the unbelievable waves in this region. You can read more about my time surfing in Colombia here. 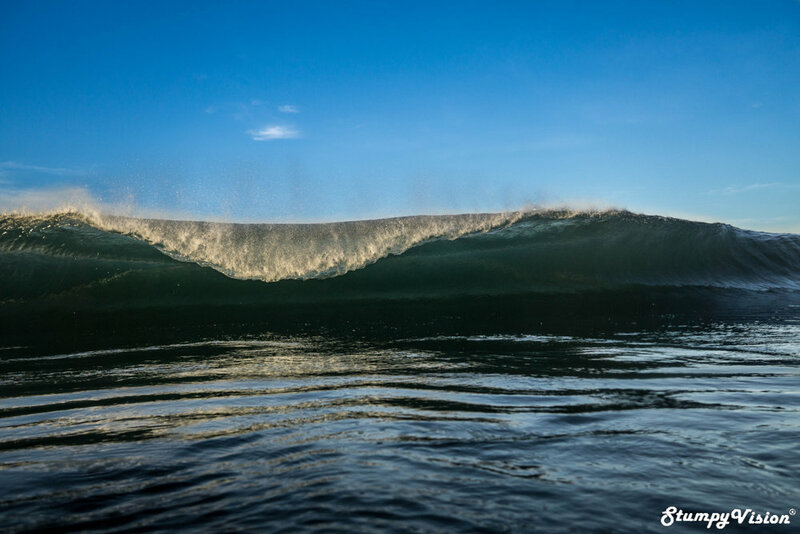 "El Gringo" is highly regarded as one the the heaviest waves in South America and it has been sitting high at the top of my bucket list of surf spots to document for a long time now. 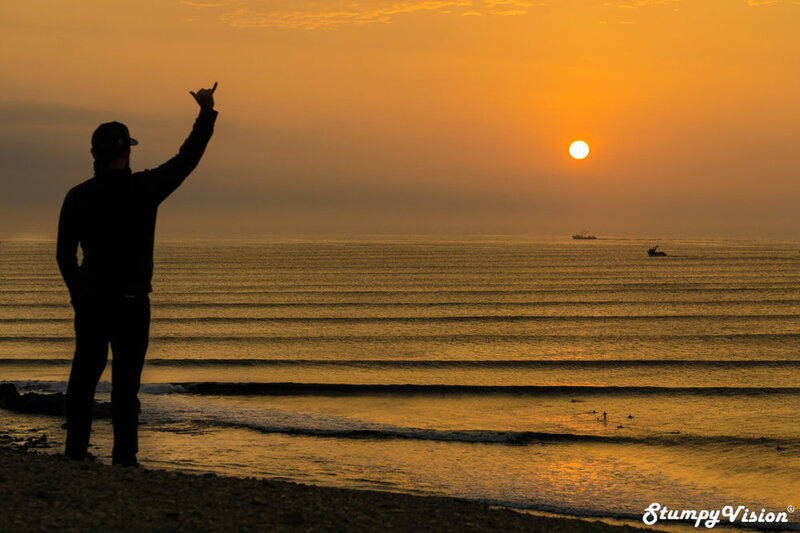 As a young skinny salty sunburn grommet I always dreamed of one day visiting the cold shores of Chile and giving the famed wave my best nudge. 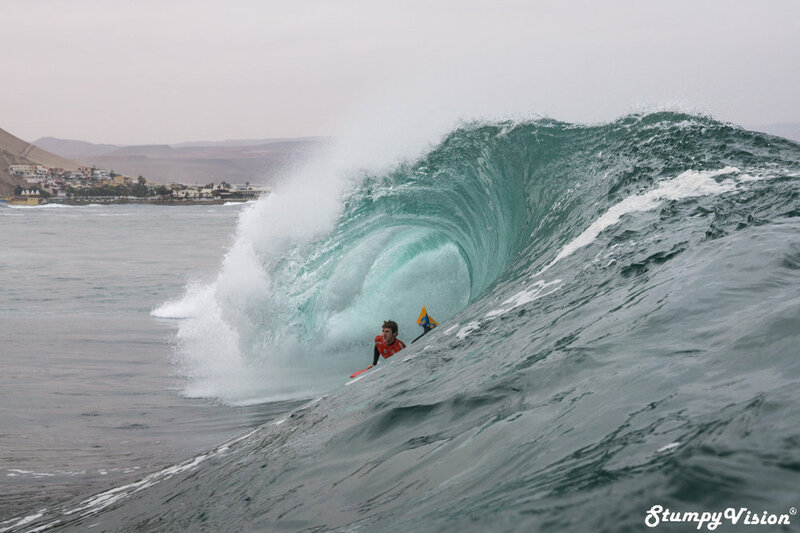 I was blessed to be given the opportunity by the APB (Association of Professional Bodyboarders) to shoot the 2017 Arican Chilean Challenge World Tour event. To be out there rubbing shoulders with the best in the business at my childhood dream wave was a moment I will never forget and definitely a dream come true for me. Pictured we have the 2017 World Champion South African Iain Campbell thoroughly shacked on his way to taking out the title. You can read about my time spent in Chile here, here and here. Photo 3: Nicaragua, A True Surfers Paradise. What if I told you there was a region that experienced a constant onslaught of swell and all day offshores for 300 days of the year? Sounds to good to be true? Well welcome to Southern Nicaragua. Any surfer worth his salt has to visit Nicaragua at least once in their life. You can read about my time in Nicaragua here and here. Mention the name of Peru to any serious surfer and instantly the thought of Peru's famed and incredibly long left-hand point breaks will flood their feeble salt encrusted minds. 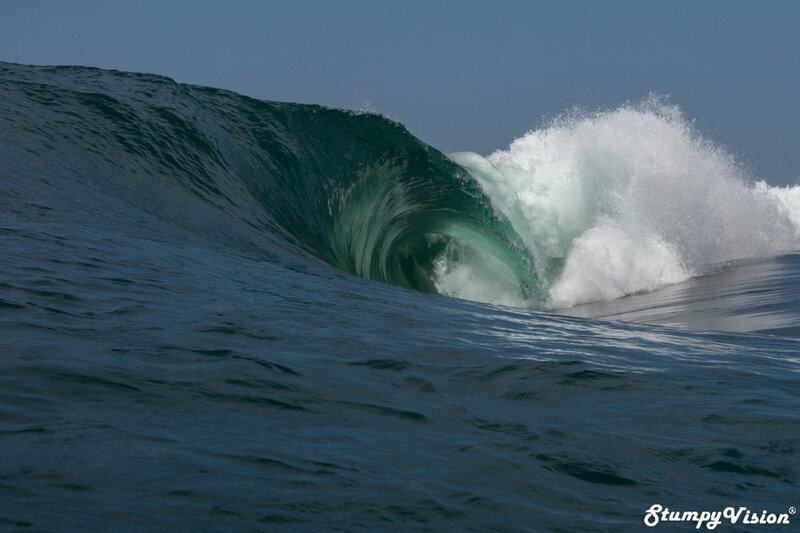 Here in Peru is where some of the longest if not the longest waves in the world are ever so quietly housed. To put it simply Peru is a goofy-foot surfers paradise and just the thought of well over minute long leg burning left-handers is more than enough to make any surfer froth heavily at the bit.What's not to love? You can read about my time in Peru here. While the mythical nation of Peru is most famed for the ruins of Machu Picchu and it's rich Inca heritage yet many an adventurous surfer is drawn here for something entirely different altogether. When the fleets of the ruthless Spanish Conquistadors first arrived in Peru in 1528 in search of golden riches and the lost city of El Darado little did they know of the other treasures hidden there. 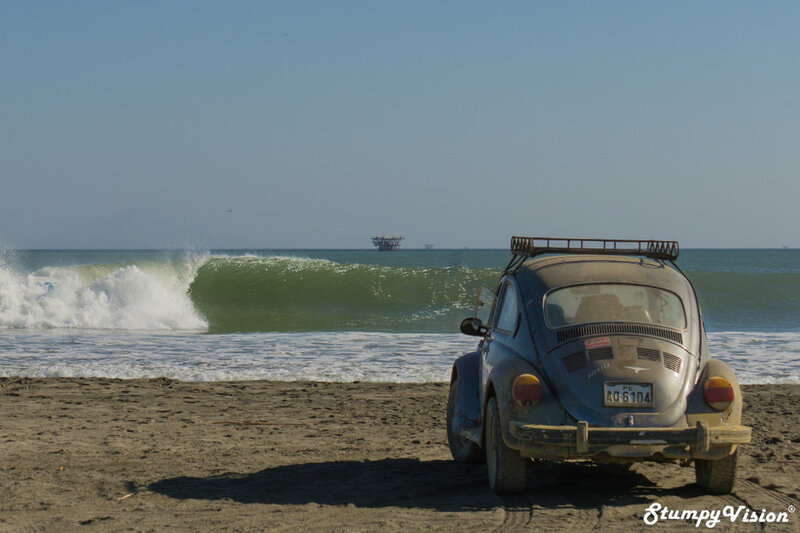 For decades now nomadic surfers have been making the pilgrimage to the famed coastline of Peru in search of gold, gold in liquid form, in the form of some of the most perfect and longest left hand waves on the face of the earth today. Located over 900 kilometers off the coast of Ecuador lies the ruggedly beautiful isolated islands of the Galápagos. While this region is typically most famed for raw beauty, vast abundance of unique wildlife and the key inspiration for the development Charles Darwin's theory of Evolution; the survival of the fittest but what many do not realise is that these world renown islands are in fact home to some of the best and heaviest waves in Ecuador if not South America. I strongly believe that we have only just scrapped the surface of the surf potential of the Galápagos islands and it must be one the few truly uncharted surf regions left on the planet with countless world class waves out there just waiting to be discovered. Pictured Santiago Piedra from Guayaquil escapes the mainland to experience the Galápagos in all it's glory. You can read more about my time in the Galápagos here and here and about Ecuador here. The magic of surfing. I am pretty sure almost every surfer would agree that the sport of surfing has made a strong positive impact on their lives. While surfing people can easily forget many of life's troubles and return to the beach relaxed with a fresh, clear and unstressed mind. For someone who has lived a difficult life and faced many trials and tribulations an introduction into the sport of surfing can be truly life changing. Surfing has been used as tool for healing for the children of Misión México in Southern México. Misión México is a refuge for abused, abandoned and neglected children and what is truly unique about the charity is that while providing a family home and education for over 250 children over the years they also give the children the gift of surfing by taking the children to the beach every weekend. The power and positivity of surfing is something that I strongly relate to and is what really drew me to volunteering at the refugee for a six month period and it was actually the original inspiration that prompted my travels. If you are interested in supporting or even volunteering at Misión México please visit www.lovelifehope.com or contact volunteer@lovelifehope.com . Volunteers must be over 21 and commit to a 6-week minimum volunteering period. You can read all about my time spent at Misión México here, here and here. 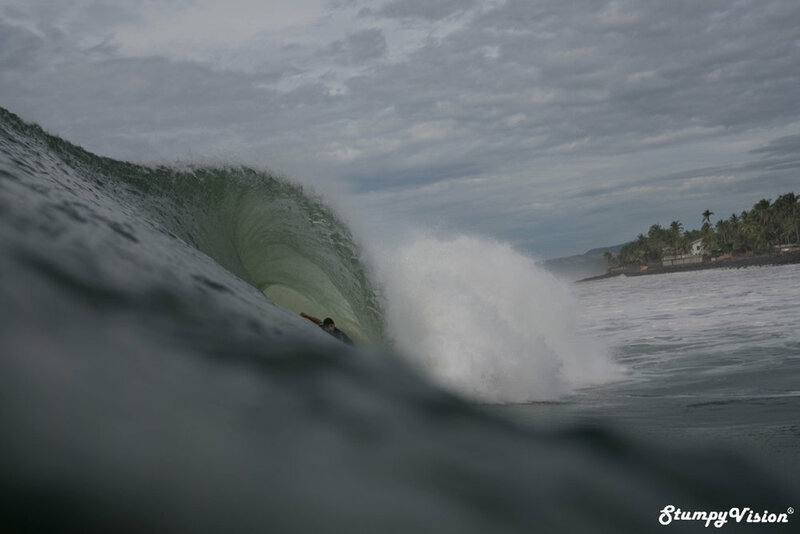 Photo 8: Heavy Water, Somewhere in Central America. I could tell you where but then I would have to kill ya! Rider Australian Sebastian Miller. You can read all about this amazing session here. 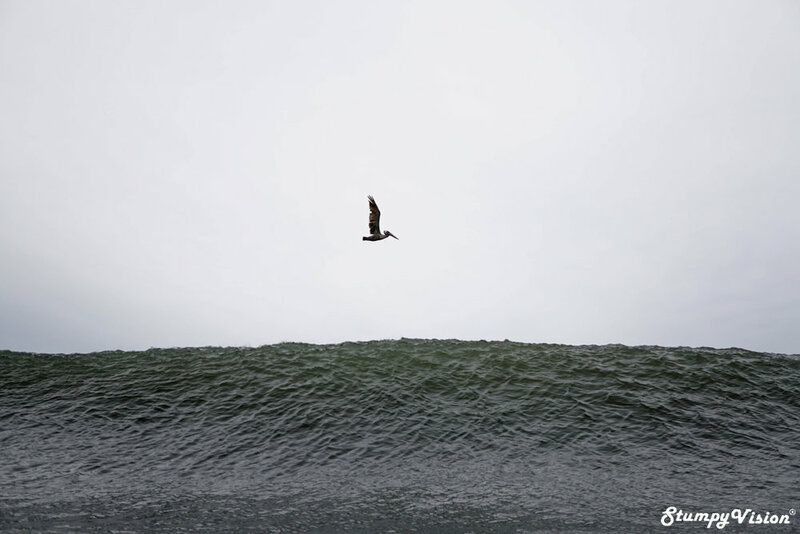 I have always enjoyed watching the Pelicans gracefully cruise up and down the beautiful beaches of Mexico on sunrise often riding in the slipstream of the waves until pulling out at the last moment before the wave finally crashes on the shore. You can read about my time in Mexico here and here. Photo 10: The Original Surfers, Huanchaco, Peru. Most commonly attribute the origins of surfing to the ancient Hawaiians yet in fact wave riding in Peru predates this. In the Northern reaches of Peru the Moche people have been riding the surf for well over 5000 years. What many people do not realise is that the Caballito de Totora was actually the first known surf-craft in human history and well predates surfing in Hawaii. For thousands of years the Moche fishermen of Huanchaco would be seen returning from a days fishing by ridding the Caballito de Totora to shore in a standing stance very similar to the stand-up paddle boarders of the modern area. This is your history lesson for the day, you can thank me later. Photo 11: City Slabs, Rio de Janeiro, Brasil. While the vibrant Brasilian city of Rio de Janeiro is world renown for it's vibrant culture and breathtaking scenery it's waves however are commonly overlooked. The assumption that Rio is merely small wave territory could not be any further from the truth and Rio has many a heavy ledging reef break hidden in plain sight. My friends if you believe that Brasil suffers from a shortage of waves of consequence then it is well and truly time you thought again. You can read about my time in Rio here. Photo 12: Dancing in the Sunlight, Rio de Janeiro, Brasil. Whatever be it your reasons for visiting Rio de Janeiro you will most likely experience one of the best moments of your life when visiting this city of extremes. I can guarantee that you will have the time of your life here whether your come to partake in the cities famed vibrant Carnival or New Year's Eve festivities or just to enjoy the abundance of beautiful sights, sounds and culture and even great waves of which Rio has to offer. In early 2016 El Salvador was ranked as the murder capital of the world averaging 22 murders a day as three powerful and extremely violent gangs battled for control of the country. It is a great shame that El Salvador has this violence hanging over it as it is an amazingly beautiful country, with amazingly friendly people and some truly amazing waves being in possession of some of the best right hand point breaks on the planet. 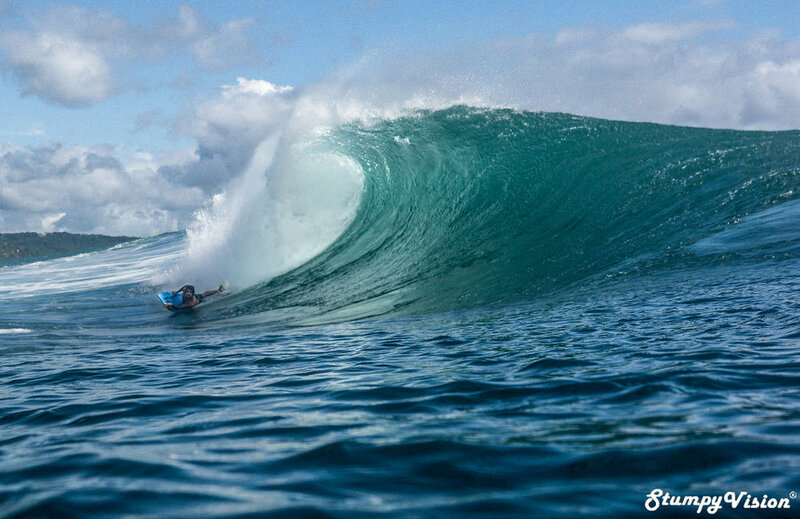 Would you potentially risk your life for some of the best waves of your life? Pictured: Brasilian Rodrigo Rohlfs risks it all for the perfect wave. You can read about my time in El Salvador here, here and here. 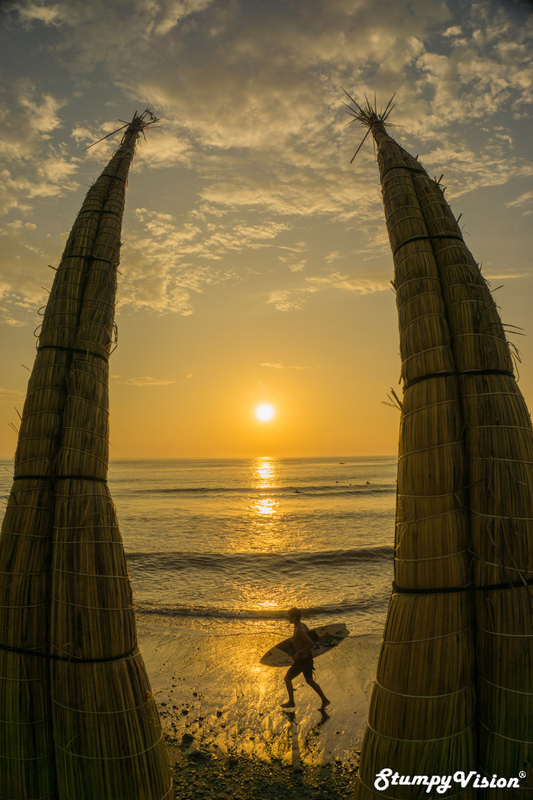 Photo 14: Golden Days, Somewhere in Nicaragua. Yes, ok I lied. 14 photos not 13 but you must admit that 13 has more of a ring to it and there was no way in hell I wasn't going to feature this amazing gem. 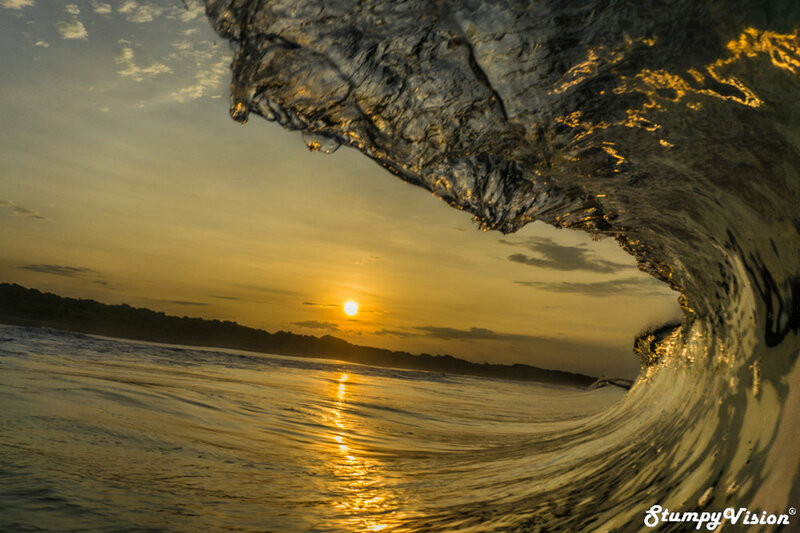 With constant clean conditions, endless swells and amazing Nicaragua is a true surf photographers dream with sunrise and sunset offering endless golden moments to capture for the frothing surf photographer with the hardest part often being which is the best photo to select. Another golden day in Nica.